Want a delicious, healthy, and filling vegan smoothie? Try this one! Full of four different kinds of summer fruits, this is the perfect drink for breakfast, a snack, or a pre- or post-workout meal thanks to the addition of protein powder. This recipe gives you the standard smoothie flavor: sweet, creamy, and tangy. And like any smoothie, it's super easy to make and is ready as soon as your blender stops running. Simply add all the ingredients to a blender, blend until completely smooth, and serve. The recipe as written below gives you more of a thick fruit shake texture. There isn't any "frozen-ness," even with the addition of the ice cubes. If you want it more smoothie-like (think Jamba Juice texture), here's a wonderful trick I learned many years ago: omit the ice cubes, and use frozen fruit! Seriously, this is one of the best tips I can give for making smoothies. The flavor is delicious: the perfect amount of sweetness, a nice creaminess from the yogurt (and you don't taste any of that soy flavor), and a nice tartness from the peach and orange juice. Even better, the banana flavor isn't overwhelming like it sometimes can be in smoothies. I'm not sure how noticeable the agave is, but I like to think it adds an extra hint of sweetness and tanginess overall. The smoothie is a bit chalky in texture due to the protein powder, but you can always choose to omit it. Personally, I think it's a great idea to add it...you'll be amazed at how well it keeps you full! Make again? Yes...using the frozen fruit method. 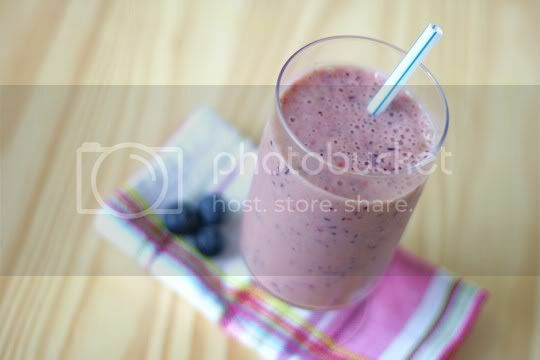 As with any smoothie, the fruit and flavor combinations can be swapped out to your palate's content! 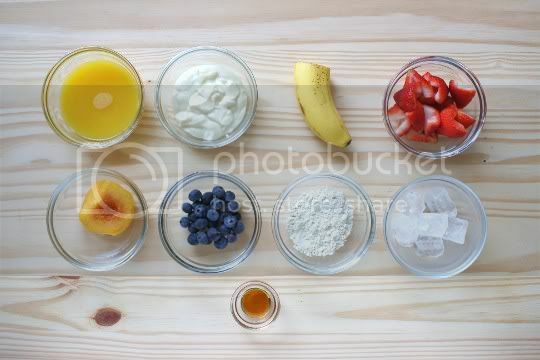 Add all ingredients to a blender, and puree until smooth. Serves 2. This looks and sounds like a wonderful smoothie! I know what I'm having for breakfast. This sounds yummyyyy! I can't wait to try it! I may switch the soy yogurt for plain yogurt. Gasp. This looks magical...I think I'd switch up the soy protein powder for hemp or whey though! Looks so good! Yum! I practically only have smoothies for breakfast in the summer. This is one I must try! Looks perfect to add to my post-workout drink recipes. 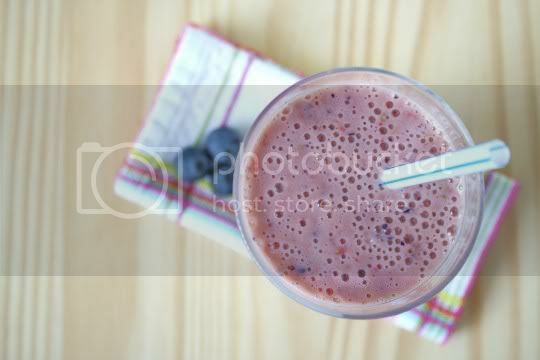 It's a healthy smoothie blended with various fruits.